FISL is underway. I did my presentation about “Developing games for KDE 4” around noon. Thankfully it was not scheduled for one of the big rooms (they are gigantic!) But I estimate that we had around 300 people or more, a good attendance, with the room completely filled. I had some trouble managing time at the end and had to skip a few examples, but the feedback was very positive. Helio Castro sat on the first row, which was great, as he could rescue me in one or two occasions! Thanks Helio 🙂 A couple of people asked about the content. If you want to check it out, the slides and support material (sample code, sample art and programs) is online here. It is in Portuguese. I was then free to roam around the conference a bit. Lots of interesting things happening. Keith Packard’s presentation about the state of X.org was very interesting, it is nice to see the advances being made in X and the explicit support (or explicit lack of support!) given by hardware developers. Some like Intel have moved to actually sponsoring 5 developers and developing their official drivers in the X.org repository, while others like ATI and NVidia are still not cooperating with free software development. It is interesting to see what will happen in the future, and if moves like these will have an impact on the quality of drivers and market share. But at least I know which graphics chip my future notebooks will have. Mistery… Why is coolo running around with shades and carrying a giant-sized gold coin? My blogger account is not getting along well with Planet, apparently… The last few posts did not show up, so following a suggestion by clee I am moving to a LiveJournal account. Fingers crossed 🙂 If all goes well I will be able to report from FISL in the next couple of days. Old entries can be found here. 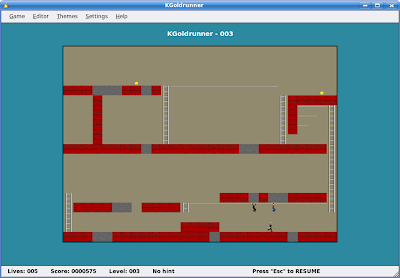 Last week I committed some code changes and artwork for KGoldrunner to SVN. This is something I was planning to do for some time, but the lack of good open source tools for animating SVG directly slowed me down quite a bit. I ended up using a commercial package (ToonBoom) to prototype the runner animation: it does not support SVG, but it has nice support for skeletal structures, so you draw the body parts and then animate their position using pivots, in a process usually called cut-out animation. But ToonBoom can not export the results directly to SVG, only to Flash, or image sequences… So in the end I kind of used it only for prototyping the movement, and then exported everything as a PNG strip, just for reference. In the end, I re-did all the body parts in Inkscape, and used groups to structure the runner as a 16-segment figure. These are cloned and positioned/rotated to generate the frames, so hopefully it would be easier for other artists to add variations of the character: just edit the original shapes, and the clones will update automatically, keeping the animation more or less intact. There is still some work to do, we are going to integrate new backgrounds and other elements to the final game before KDE4 is ready. Notice how the runner and enemies are small in the final in-game version: this is one of the reasons why it was so difficult to animate them, as small details are lost. Checkout kdegames in SVN to see them in action. Ah! And of course, the old themes are still there, for the nostalgic.